Can the one least like you be just who you need most? 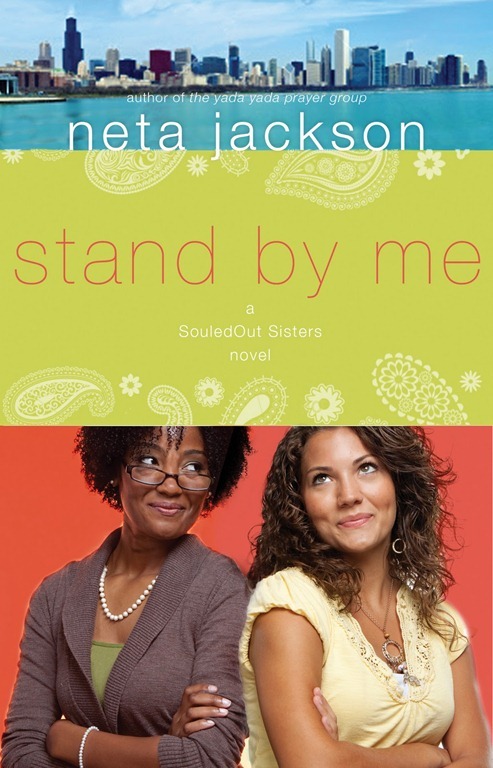 In many ways Stand by Me by Neta Jackson is a book of opposites. One character tries to discover their place in the world yet the other clings to stay in a familiar place. One character is reserved while the other is outspoken. One character dumpster dives by choice the other rescues food by necessity. One character is on a second marriage but the other has the hints of unknown love in bloom. The key characters Avis Douglas and Kathryn “Kat” Davies couldn’t be more different. Avis a middle-aged, African American principal, who is a seasoned saint struggles with her husband’s sudden need for change and her estrangement from her HIV infected daughter. Kat, a young, Caucasian college student striving to escape the expectations of her prestigious family tries to get a grip on her newfound faith in Christ. But as their two worlds collide through their membership at the multicultural membership church, Souled Out Community Church, readers are driven along a dumpster diving, heart-wrenching tale. This book will have readers examining their own openness to new relationships and their hidden prejudices. In the end, readers will be reminded that God often uses the least likely people to sharpen us and to fulfill his purposes in our lives. 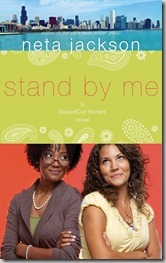 Neta Jackson is the author of the popular Yada Yada Prayer Group Series, which has sold over a half-million copies. According to the author she hopes readers will walk away from Stand by Me thinking deeply about how much we need the other parts of the body of Christ, especially on a personal level-whether that’s a person in our church with whom we think we have nothing in common, or the least of these who have something important to give the rest of us, or a neighbor or co-worker who may attend a different denomination who is nonetheless a sister or brother in Christ from whom we have something to learn from their life experiences or perspectives. Disclosure: I was provided a complimentary copy of Stand by Me from The B&B Media group in exchange for unbiased review. Views and opinions expressed are my own. Wanda thank you for sharing. Well as I have always heard, opposites make for a good match. Blessings. I think there is some truth to that statement JBR. Sameness helps us remain but different challenges us to see things from a different perspective. I loved the Yada Yada Prayer Group series! Jackson incorporated humor, faith, realism, and great characters. Avis Douglas is actually one of the characters from that series. Thanks for the write up. I’ll have to check this book out! This was my first time meeting Avis and Neta Jackson but I would be interested in reading her other books. I have heard about the Yada Yada Prayer group series but never read any of them before. I’m reading this book now. So far I’m loving it! I really want to go back and read the Yada Yada prayer group and Yada Yada house of hope series as well. I haven’t read any of her previous books either Kate but after reading Stand by Me it makes me interested in reading more from her. Did you feel like it would have helped to read the other books first? I get the feeling some of the characters were given backstory in previous books that are alluded to in this one. I don’t really feel like I missed out on the essence of the book by not having read the other books. Although according to Ms Jackson’s comment on the review, we would get to know some of the characters on a deeper level if we read the Yada Yada Prayer group series. blessings…in my experience a lot of times people who think they are different are not really as different as it seem. Sometimes the difference is only on the surface. But the fundementals, the philisophy in life, the root, spirituality sometimes is on par and there is where one has to focus. This book sounds interesting. I will see if my library have it and grab a read see if i see what you see and feel what you feel. Rhapsody recently posted..Sifting through my email……. Now that’s so true Rhapsody. When we get past the easily recognizable differences, we find that we have some of the same struggles. Hope you enjoy it Denise. I really did. Have a great week! Hi Wanda! Thanks so much for the great review! And I enjoyed reading your readers’ comments. You don’t have to read the other two series to “get” STAND BY ME–but I think you’ll really enjoy getting to know Avis on a deeper level in the Yada Yada Prayer Group series, as well as Edesa and Josh BEFORE they were married, etc etc. What I’ve done is create a community of people in the Chicago area, and you’ll meet many of the same people in the various novels/series, as well as some new ones. ENJOY! (And it’s a bee-yoo-tee-ful day here in Chicago! Heading up to mid-70s–and it’s only MARCH!!!!! Hi Neta, I am honored to have you stop by and read my review. I really enjoyed the book and it would be interesting to learn more about the characters from previous book. Definitely putting the other books on my TBR list. “God often uses the least likely people to sharpen us and to fulfill his purposes in our lives.” A very profound statement. When I was in grad school two of my best friends had very (AND I MEAN VERY) opposite personalities. Each of them would separately complain to me, asking how I could be friends with the other. Their almost childish behavior use to make me both a little sad and happy. I don’t know if they actually understood how much I appreciated them cause they were so focused on the “faults” of each other. One was a by-the-book, all orderly, type, and I would travel with her anywhere because she would plan every detail and all I had to do was show up. The other one was so scattered when I had any appointment with her I’d just leave my day open because there was no telling what would happen. They both remain very important friends, with very different purposes…,.and they still don’t get each other, or my friendship with them. LOL! Couldn’t help but laugh as I read this LaVonne. All the people God places in our lives do not mix well together but they are beneficial to us. Now that Miss Wanda sounds like a worthwhile read. I’m finished with my winter reads other than a couple book reviews I’ve committed to but this sounds like a great book to start next winters booklist. Woohoo….thanks sweetie!!! I would definitely recommend it for your TBR list. So do you just read during the winter months and spend your spring time doing outdoor activities? Hi! Wanda…God Bless you…My thoughts is that we all have something that we can bring to the table. I have personally have learn so much from others, their own knowledge, experience, etc. And I am hoping others are getting something from me as well. It’s good that we can come to the table and share what we have with one another. Of course the books are new, and the authors are also to me, but I am very much willing to read them. I have truly been blessed just by coming to your page, and hearing about all the different books and authors that are out here. I would be willing to read her books, as well. Thank you for sharing these with us. Have a bless day. So true Ms Betty. Not only have we all given an opportunity to come to the table but we also have something of value to offer to others. Although many times we fail to see the value in what we have. 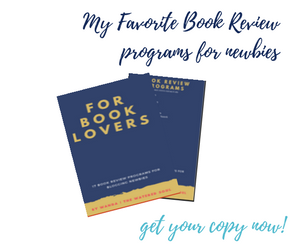 Since becoming a book reviewer, I have come across many new authors and it’s been a pleasure to dive into the pages of unfamiliar books. Blessings.